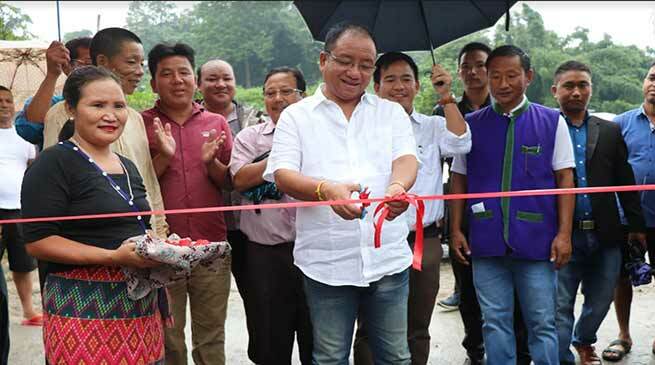 Itanagar MLA Techi Kaso inaugurated 191 metres long CC Pavement road from Forest Corporation to Sangrik Hapa colony. Leaders will always serve the society at all time and in all condition when there is a demand and request of the public said Itanagar local MLA Techi Kaso. Kaso was addressing the locals of Forest corporation, lower forest colony and Sangrik Hapa colony today on the occasion of inauguration of 191 metres long CC Pavement road from Forest Corporation Tri junction to Lower Forest Colony. Kaso said that it is a human nature that when there is a demand from the children, then parents will have to look into it. Since the public demand will naturally address in phase manner as the scheme proposed last year would be executed first while the new schemes will be taken up for next year. There are hundreds of sector and colony roads which have been taken up for converting into CC pavement and black toping while few left out would also be taken up. Present government is for people and all problems and need based schemes will naturally be looked into in phase manner and appeal them to have patience. While appealing the local to maintain the CC road, he requested not to dig the roadside otherwise it would be damaged and its durability will be reduced. At the same time he requested the gathering to maintain cleanliness and plant trees for more greenery in the area for clean environment. PWD CD ‘A’ AE Neelam Mama while inform that the CC pavement road with an estimated cost of 25 lakhs is almost completed while few more portion of the said road would also be done on priority, it need to be used properly so that it is maintained. Senior Dr. T Mara, PWD JE Christana Techi, Sangrik Hapa Colony Development Committee executive Members among other also address the gathering.